In the preface to The Book of Trees: Visualizing Branches of Knowledge, author Manuel Lima says that he “could never find a wide-ranging book dedicated to the tree as one of the most popular, captivating, and widespread visual archetypes,” citing this as his motivation to create this book. Lima provides an introduction that discusses some examples of trees in art before moving on to a timeline of what he considers significant characters in the development of information mapping. Chapter One, Figurative Trees, is the most satisfactory chapter with lush images of figurative trees from 1250 to 2012. Publisher Princeton Architectural Press describes this title as a “companion volume” to Lima’s 2011 Visual Complexity. Since this book is the offshoot of another project and considered a companion volume it could perhaps be forgiven for seeming limited in its discussion, but the book brings some of its own problems to the reader. The book is disappointingly small. Details on many of the illustrations are simply too small to engage the reader. Some of the images are very interesting and it is dissatisfying to squint at the page in an attempt to make out the details. If the book is intended to be a source of browsing for inspiration, it should have been printed in a larger size. This would increase the printing cost but would have made the illustrations, justifiably described on the back cover as “intricately detailed,” much more visible. Lima does not include his selection criteria for the images. From the vast world of visualized data interpreted in tree format, it is not clear why he selected these particular images. This thought occurred to me after the seventh mention of copyright attribution of a figurative tree image to the British Museum. 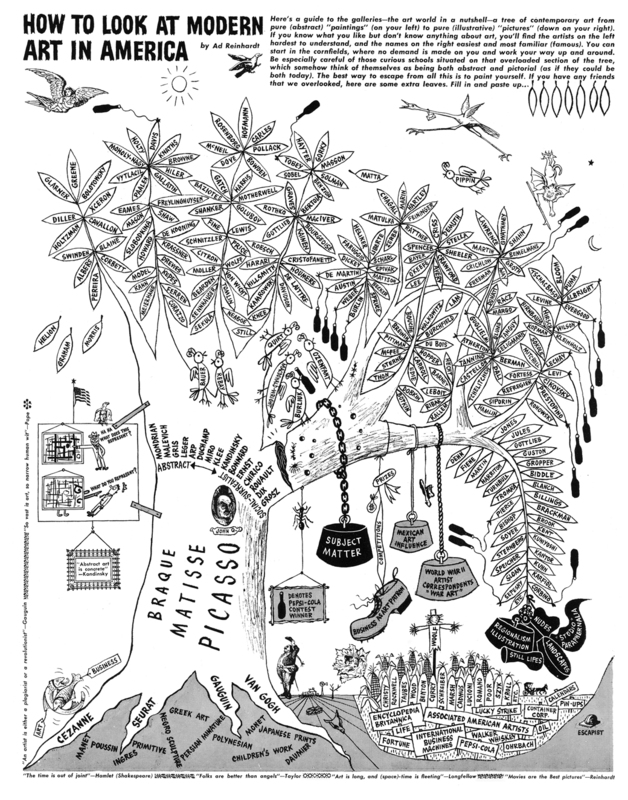 In the selection of images created by data visualization tools, why not include one of the most obvious sources, ancestry.com, the online genealogical tool or the radical infographic creator Ad Reinhardt, in particular his send up of the family tree of Modern Art? In the introduction Lima remarks “all efforts were made to identify and uncover the most significant examples,” but qualifies this statement by saying that some examples were “simply impossible to track down and bring to light, but certainly not for lack of trying” (p. 11). A statement of the criteria used to define what made the chosen examples significant and warranted their inclusion may have helped support his argument about his the relationship between these different types of knowledge branch systems. Yet the next four pages are an un-illustrated timeline. If the goal of the book is to illustrate the connection between figurative Trees with current forms of data visualization, this text Timeline is a missed opportunity for strengthening that argument. I’m not certain this publication supports this claim–I can agree that visual representations of information have taken many forms, but I knew that before opening the book. What I wanted to more know about is the point of departure for figurative forms that can be understood without a key versus dynamically generated forms of information representation that require additional knowledge for a viewer to interpret. Let’s take the example provided on page 166, Oliver Deussen’s Eclipse Voronoi treemap, which almost looks like a cell. The description says is it a “treemap of the hierarchical file structure of the multilanguage software development system Eclipse, showing fifteen thousand classes.” Well, classes of what? Software programs? What do the different hues of purple mean? Unlike figurative trees which can be understood by their iconography, a Voronoi treemap is only useful to its creators or viewers with knowledge of its subject matter. Clearly, I had higher hopes for this title. Individuals looking for a browsable title of interesting images may be satisfied but readers exploring the text may remain unconvinced of his arguments. The book could have been a much richer title if it had a larger format so the very detailed info graphics could actually be read. I could overlook some of its other flaws if this had been the case. Manuel Lima’s Book of Trees is published by Princeton Architectural Press, ISBN 978-1-61689-218-0. Purchasing from Amazon.com helps support the Designer’s Review of Books. Rebecca Kohn an academic librarian, presently the librarian for Art, Art History, and Design at San Jose State University in California. Her exhortations about research are posted at Bookcharmer and her more whimsical side is present on Twitter as @Bookcharmer.